The next 1/2 year Forecast Dates are available for purchase. Subscribers receive 6 months forecast no matter when they sign up. I've changed the format a little by including more Video. This weeks post will be a little shorter as I'm writing the November subscribers report. 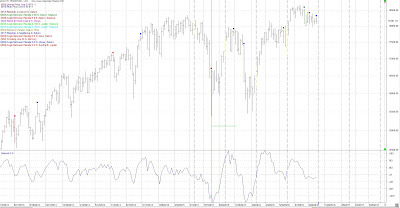 For the SP500, cycle-wise June 27 was the last Primary cycle trough. 1 that puts us entering the 19th week. I was looking for a possible 50 week low to coincide with that June 27th Primary trough. The sharp move up after the June 27th Primary low seems to confirm this was the 50 week trough as well. The month of November 2016 will be influenced by Neptune. There are 5 transits to Neptune and it will be turning Direct. This should color the period with Neptune issues. Neptune stands for Socialism, left-wing political idea. It is linked with mobs, secret police, sedation, fraud, swindling, illicit undertakings, bogus companies, loss, lies and deceit. The exact dates of transits are reserved for subscribers. 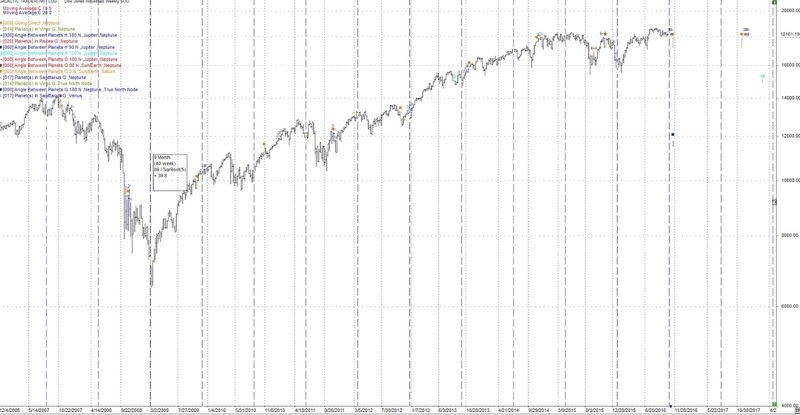 In addition there is a 12 year cycle hitting near the end of the month. This synodic cycle relates to the growth of international terrorism and political power. It also has evidence of an impact on the economy. In brief, the attainment of power of all kinds. Mars entered Capricorn on Sept 27th where it is exalted. One more piece of a move from mutable signs to Cardinal signs. Here Mars, male energy, is the initiator of action in the worldly environment and is kept in check by Saturn the ruler of Capricorn. Mars leaves Capricorn and enters Aquarius on November 9th, the day after the US Election. 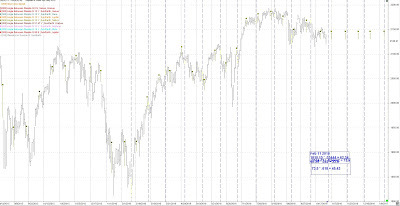 Planets changing signs often occur near the markets changing trend. We saw a number of earthquakes over 6.0 in October. With a number of Neptune transits in November we may be seeing more. 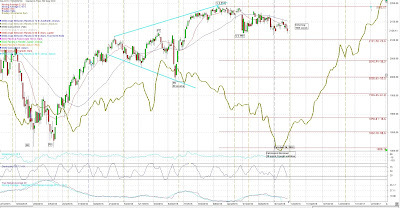 Following is a daily chart of the SP500. The grey line is an adjusted Bradley indicator. It's purpose is to find a change in trend. This is not straight forward to read and the details with video are in section 9 of the subscribers report. With the latest news out of the US and the election with the FBI reviewing additional eMails it seems to fit with a period of time when Neptune is active. Lies, deceit and confusion. For longer term readers, this may be the surprise I was looking for. 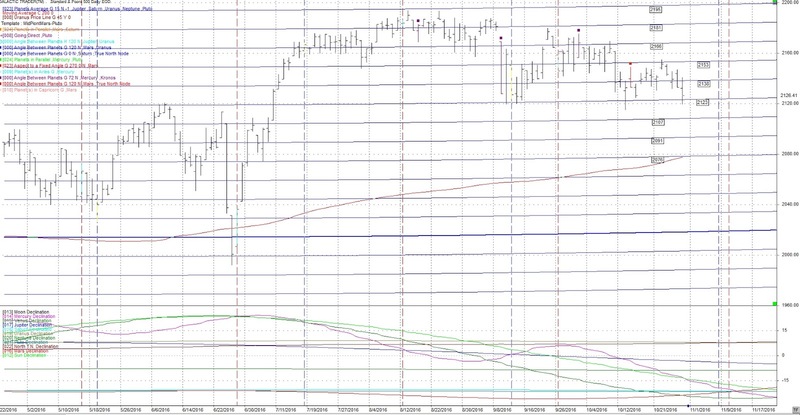 Following is our normal daily chart for the SP500. Price is now below both the 15 and 45 day sma's and the 15 day is below the 45 day. A usual setup leading into a Primary cycle low. In addition there is a Mars waning square to Uranus and Venus conjunct Saturn on Saturday October 29th. Mars waning square to Uranus is a powerful aspect but needs a wide orb +- 1.5 weeks. Venus conjunct Saturn has a strong correlation to Primary cycle turns. I think these will wait closer to the November 8th date. Following is a chart of the planetary average longitude. The horizontal blue lines are based on the average longitude of the planets Jupiter, Saturn, Uranus, Neptune and Pluto which are converted to price. 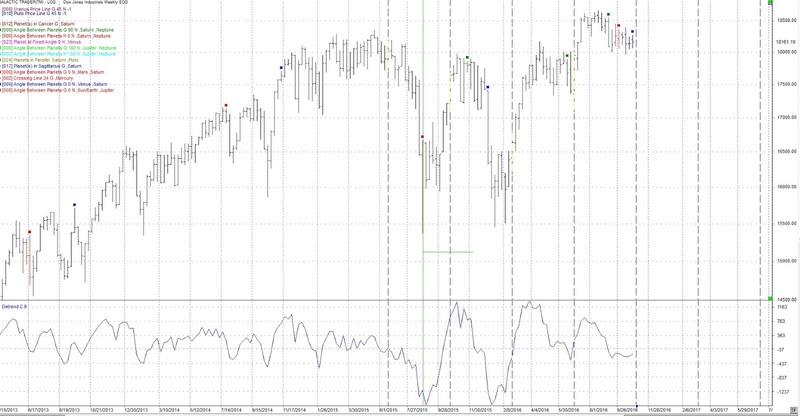 The levels this calculates typically are excellent points to place sell or buy stops. I often use them with Fibonacci retracement levels as well. Price started down Oct. 24th and appeared to be speeding up with the US election news on Oct. 24th. Note my comments on Saturn position further up n this post. 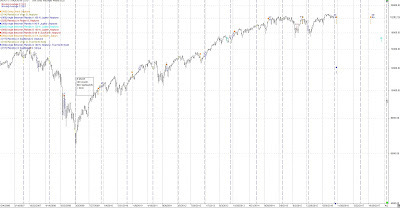 Two charts we have not shown for awhile are the weekly charts of the DJIA with the 40 week and 18 cycles. The cycles are the vertical blue lines. Both are due to turn down. 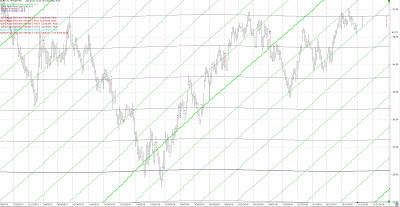 I continue to watch the 24th harmonic cycle (360 / 24) cycle between the Sun and Saturn, which are the brown squares on the following daily chart. The next hits are Nov 4th then Nov. 23rd. 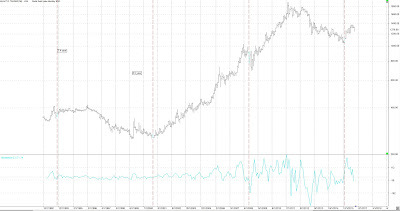 They are often at short changes in trend. And for the election crowd. Gold appears to be trying to move up. We have hit a couple of the dates identified in the subscribers report with more to come. 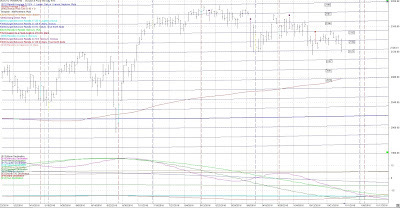 A review of the daily chart shows the 15 and 45 day sma are pointed down with the 15 day flat and price below both. The Gold Primary cycle is due for a trough. It is currently entering the 21st week. 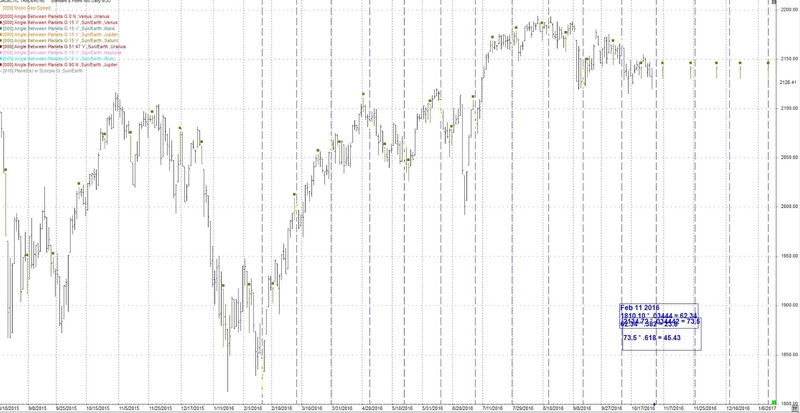 Beyond the nominal 18 week cycle there is a 13 1/2 month cycle that is due for a trough then up. It is possible October 7th was the Primary low but unconfirmed. Price hasn't made a big move up. 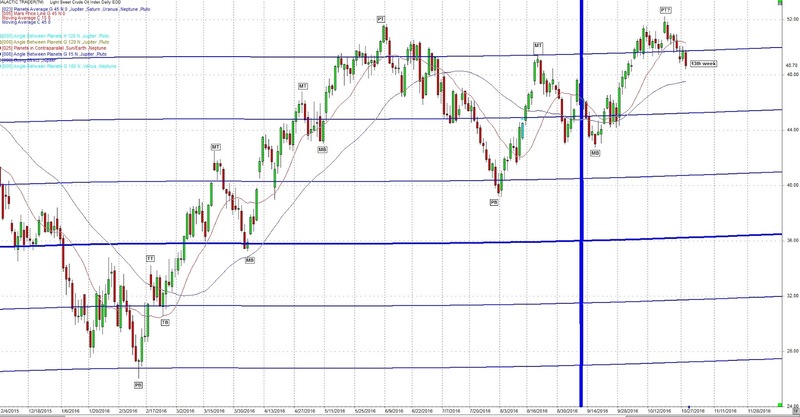 I'm looking for a trough in Gold between November 2 -9 or near November 24, 25 both +- 3 td's. When the trough is in we may be looking at a significant rise in precious metals. 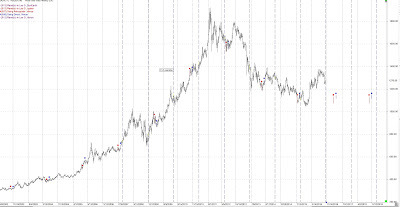 The next chart is a longer term monthly chart showing the 7.4 year cycle in Gold. They are the red vertical lines. Note that the 7.4 year cycle put in a low in late 2015. 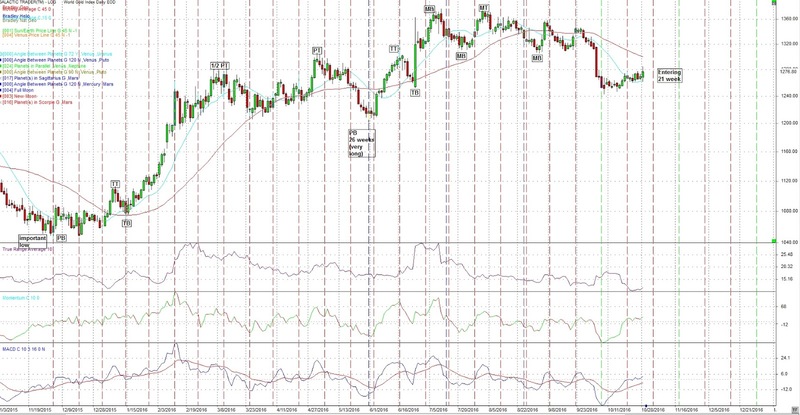 We are now in a pull back but we are very early in the 7.4 year cycle which should be bullish in the long term. I'm looking for a more substantial move up later in November. I'm watching all aspects to Jupiter or Neptune, the two rulers of crude. The price of crude is subject to the vagaries of the OPEC group and the actions of it's individual members. We had been looking for a retest of the August lows but now may have put in the crest of this Primary cycle on October 19th. Many markets will be influenced by the US leading into the November 8th election. With the multiple Neptune aspects crude could be volatile in November. 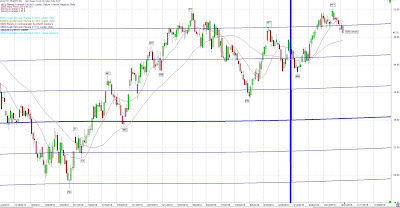 Crude may be headed down here or it could put in one more Major cycle (6 week) high and then down. 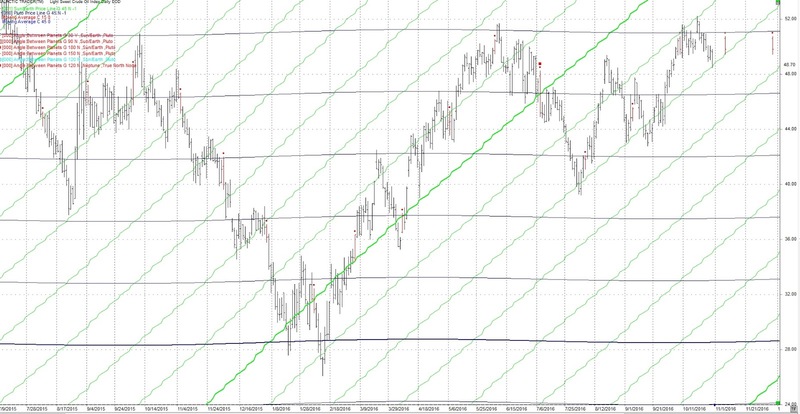 Following is a daily chart of crude shows the price lines for the Sun (green) and Pluto (black). Note that recent moves down in crude have been stopped at the up sloping green line, the Sun price line. Pluto, the black line often acts as support or resistance. Please don't advertise in the comments section. 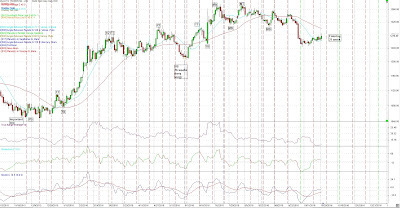 Gold could pullback in the first couple of weeks of Nov but it should be going up going forward.